Before we get to the cookies…. 2. You might have noticed some changes here on Crunchy Creamy Sweet. In fact, if you stopped by here in the last few days, you may have even got dizzy from rotation of my blogs elements, some things disappearing and some appearing. Anyways, I hope you will be patient with me. I will be posting as usual and eventually will move everything and settle in WordPress. I will keep you updated! Well, I found yet another way to make chocolate chip cookies without turning the oven on and still be able to enjoy a crispy chipper. I have to say, I was skeptical when I saw this recipe. But nevertheless intrigued. I had to try it! How did they turn out? Pretty good actually. But there are few tricks to this method. 1. The dough is more a batter than a dough. But don’t let that fool you. It will be a little watery after you mix all the ingredients together and you can even place it in the fridge while preheating your waffle maker, so the dough will set a little. 2. I recommend using mini chocolate chips or chocolate chunks for this version. 3. You really have to keep an eye on these. They burn fast! Of course, it depends on the temperature setting of your waffle maker, but you should know your little gadget and adjust the settings as needed. I have a Cuisinart waffle maker and I set it on 3. 4. Let them cool and they will be crunchy. At first, they feel… well,… like waffles. Soft. But then as they cool, they get crispy like cookies. 5. It’s a fun way to cheat the heat and still enjoy a crunchy cookie! The kiddos love this idea! The dough is so easy to prepare that they can help with stirring it. Fun twist on a classic. Chocolate Chunk Cookies made in waffle maker. In a microwave-safe measuring cup, melt 1/2 cup of butter. In a small mixing bowl, whisk together the dry ingredients ( flour, soda and salt ). Add chocolate chips or chunks to dry ingredients. Stir. Add both sugars to your melted butter and stir together until smooth. Add egg and vanilla and stir again. Add the dry ingredients with chocolate and fold it in. Do not over mix. You can place the bowl with your dough in the fridge while preheating your waffle maker. Scoop the dough by teaspoons and bake for about 2 minutes. Check on the cookies. You can bake them for another 30 seconds if you want them more brown and eventually more crunchy. Let cool on a wire rack. They will crispy up as they cool. I just found your site from a link at Finedininglovers.com. The cookies look amazing and I’m going to a food swap this week. I think I might have to take some to swap. My question is this: do I really only use a teaspoon of batter for each cookie? That just seems like so very little. I think I’ll take a looks around your blog for a while. With the amazing recipe and pictures I found here I’m sure I’ll find more treasures! Hi Kim! Welcome to CCS! I am so glad you stopped by! I suggest starting with a teaspoon of batter and if you think you want them bigger, you can try two teaspoons. I wouldn’t go bigger than that, simply because they will turn into waffles 🙂 I hope you will love them as much as we did and come back and let me know how they turned out. Have a wonderful weekend! I have made the cookies a few times for my family and we all LOVE them. I brought them to a food swap tonight and they were loved there as well. One guy had a hard time putting together words to describe how much he liked them. I think he’ll be looking for your blog soon so he can make a batch of his own. Thanks for the great recipe. saw these on Pinterest I believe – and they are so adorable and creative! Thanks, Averie! They are always a big hit with kids! 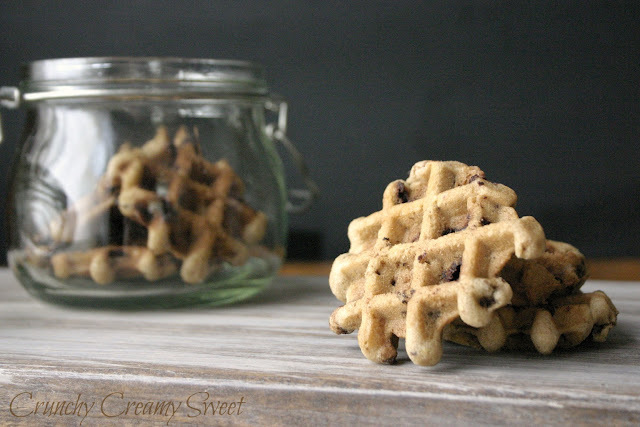 I have a waffle cookie recipe that I’m not in love with, dying for a new one! Can’t wait to try these Anna 🙂 I love how quick and easy waffle cookies are! Dangerous though…. in about 10 minutes you can have a full batch of warm cookies…. So glad you like it! Thanks, Carrie! Congrats on the move to a self-hosted blog, Anna! It is a lot of work but worth it in the end. These cookies look so good! 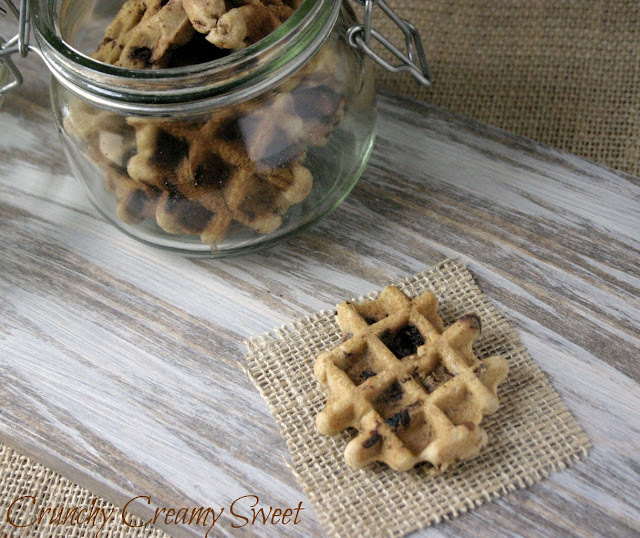 What a great idea to use the waffle maker and avoid heating up the kitchen on hot summer days :). I am already loving my blog’s new home! Lots of work but I’m excited for it 🙂 Thank you, Laura! I just moved my site to self-hosted WordPress last week. It was mostly painless and I’m still working out kinks and figuring out plugins, etc. Let me know if you want another newbie to brainstorm with! It looks great. Your site is absolutely gorgeous, Jen! Thanks for stopping by! holy- those looks so delicious. 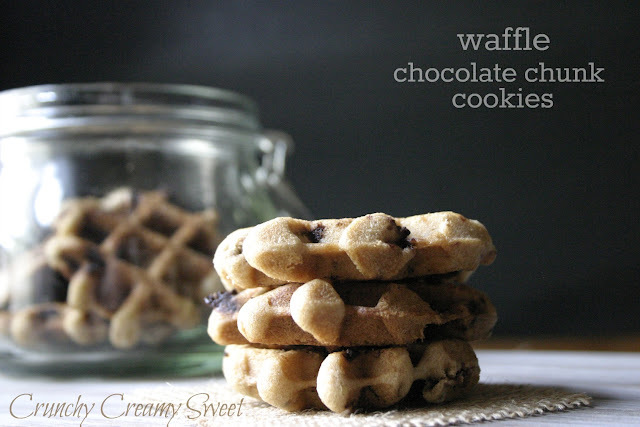 I LOVE Waffles, so a waffle chocolate chunk cookie ?? Even Better!! & Congrats on his first steps! We have a new 4 month old Niece, and she is just teething.. can’t wait til she begins to move around!! Thank you so much, Alicia! Great to have you here! These cookies must be fun to make! So delicious too. First, congratulations on your bundle of joy's first steps…so exciting, I can feel it too!! Those cookies look smashing!!! You are an amazing baker. What a fantastic idea. Love the recipe and the look of your blog with all the changes so far. Thank you, Ellen! I am glad you like it! 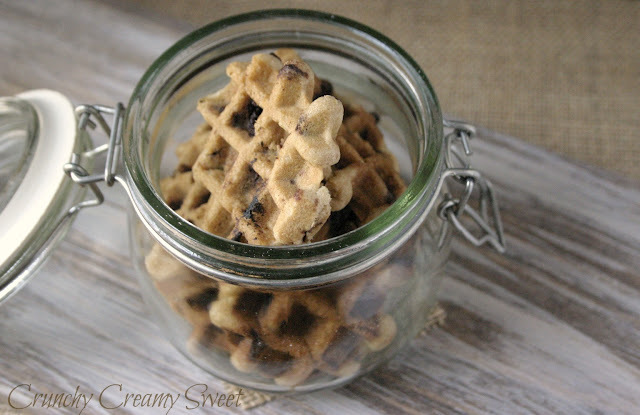 I absolutely love your idea of waffle cookies…so creative:)Have a wonderful Monday! Oh wow, these cookies look so perfect and professional! I loved the picture.